Tuner cars are definitely the domain of younger car guys. They squeeze enormous power out of engines the size of a picnic basket and there’s a tuner car culture built around these street machines. 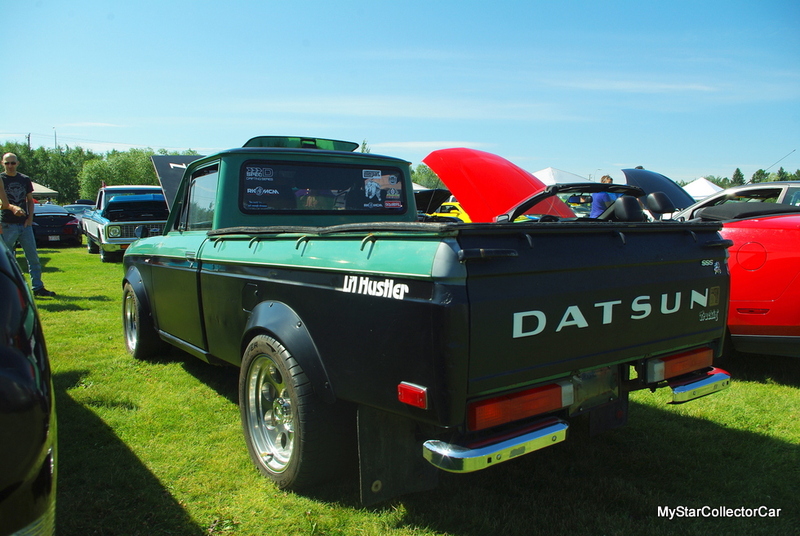 The tuner car concept may be hot now but it’s hardly a new idea in the hobby and this ’72 Datsun truck is a great example of a retro-tuner concept. 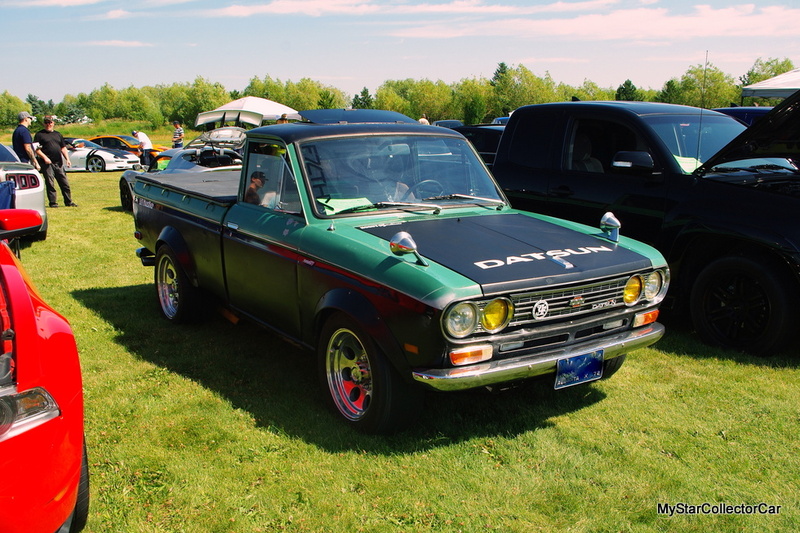 Dave McCormick is the proud owner of a 1972 Datsun pickup and it’s not his first time behind the wheel of one of these trucks. 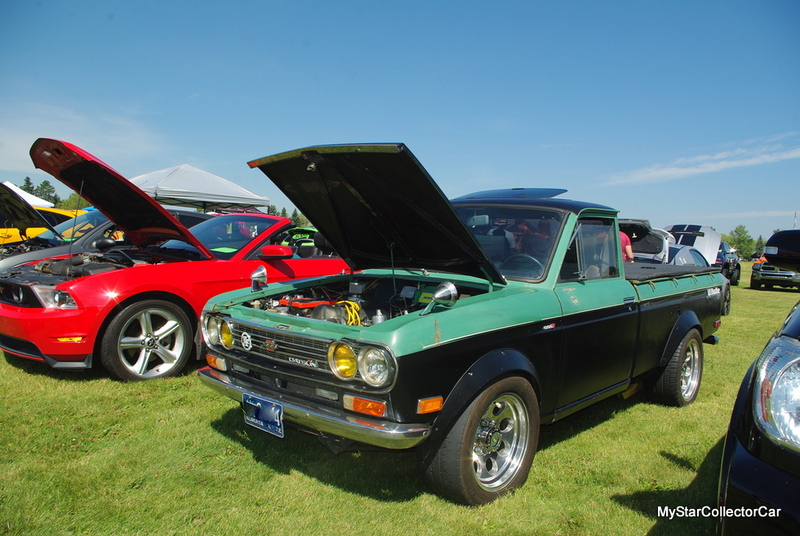 He owned another one in his youth and he’s “always been fascinated with 510s” so this truck was a good fit. Dave’s truck was definitely tired so he could only do about 50 miles per hour before it would overheat. 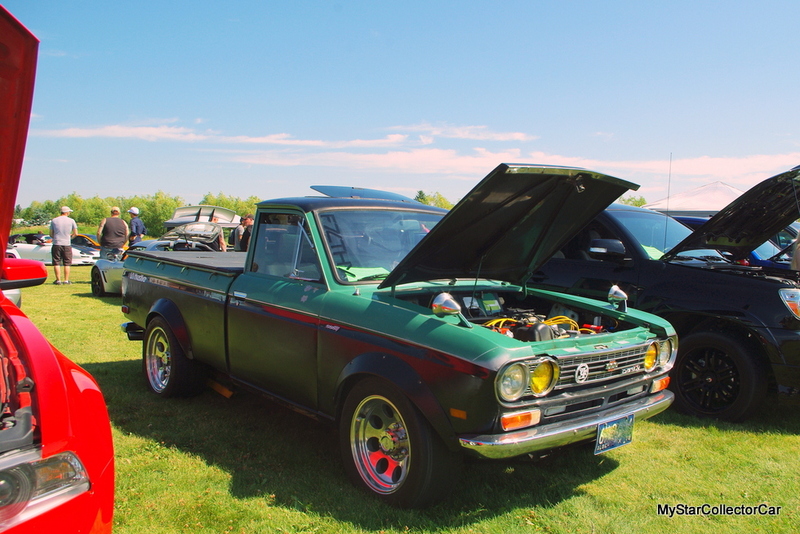 He decided to go with a SSS Datsun performance theme with period correct parts so this truck has a number of early 70s performance upgrades. 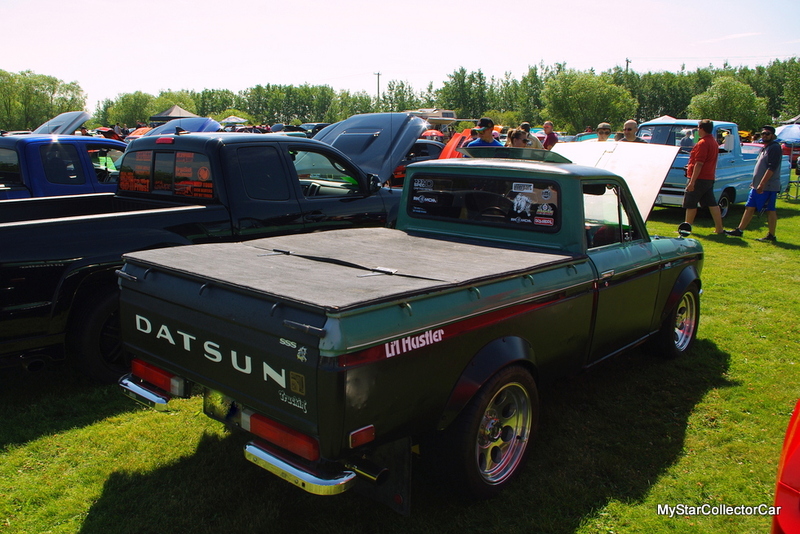 Dave estimated his truck has climbed to a respectable 130 horsepower from a stock 96. Dave built his engine “with speed equipment from that era”. He tried about “eight different headers” before he settled on the current system. 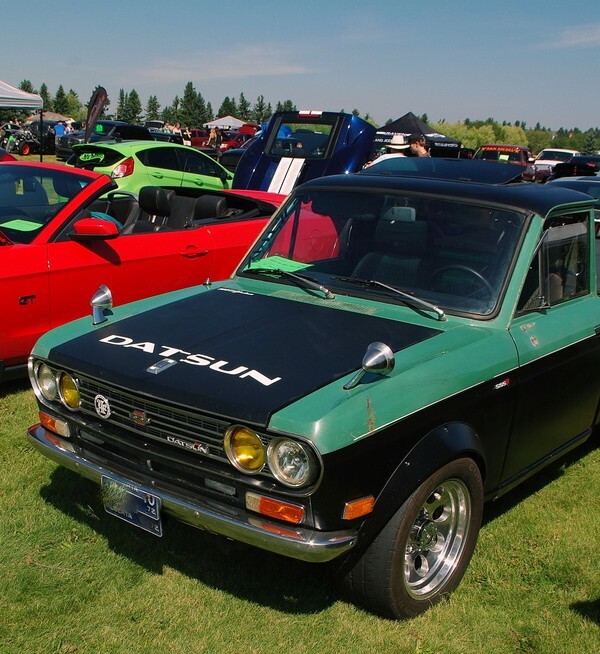 He upgraded the carbs to early 70s performance specs—along with a few other tweaks and now the little Datsun pickup has a red line of 8000. 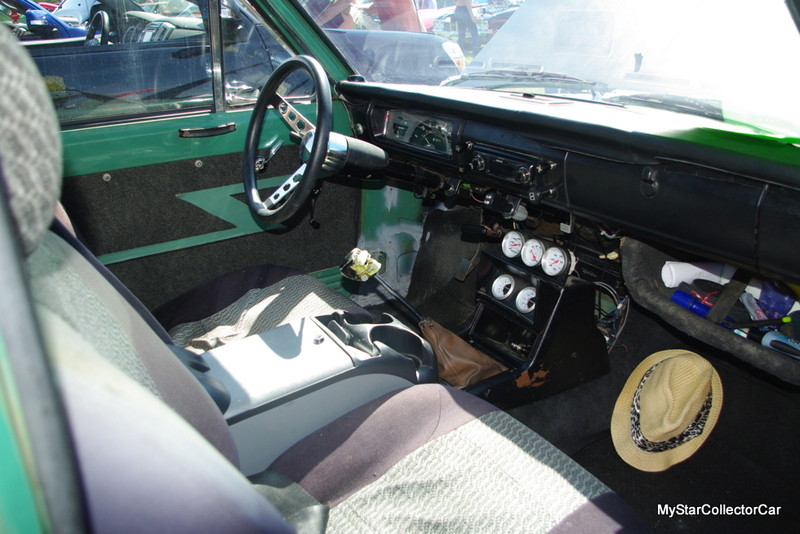 Dave said the stock versions red-lined at 5600 rpm so he can really wind out his truck when he has the need for speed. He went with gauges because Dave “likes to know what’s going on with the engine”. 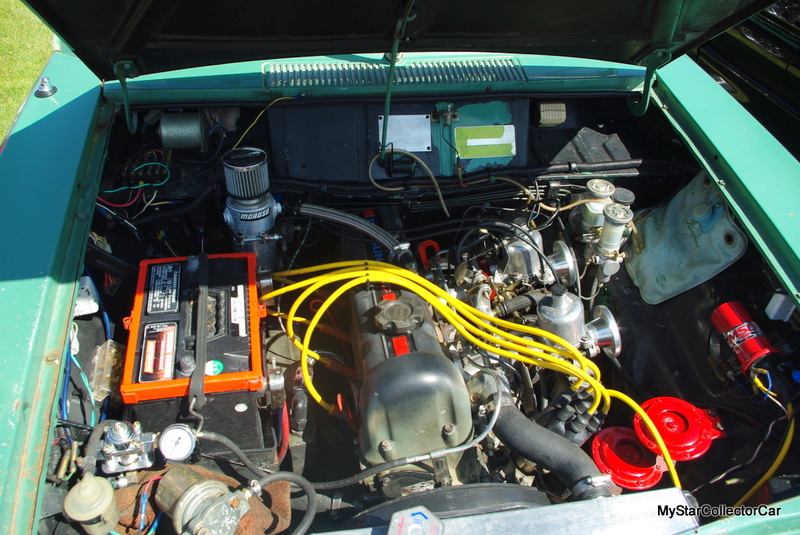 Dave also knows the old adage, “it can go but can it whoa?” so he replaced the single master cylinder with duals. Disc brakes (front and back) are also part of the package because Dave’s truck—an early version of a tuner car has to stop like a tuner car. 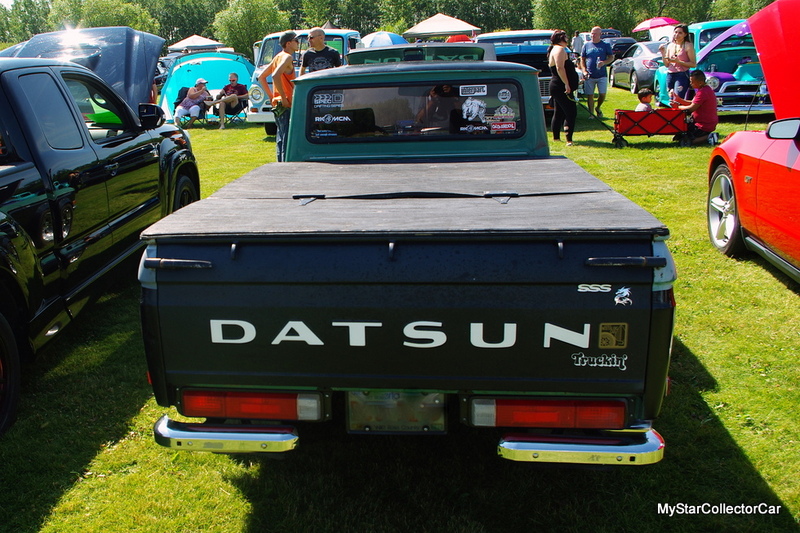 He added the vintage Datsun rally treatment to the hood because his truck qualifies as more than stock. 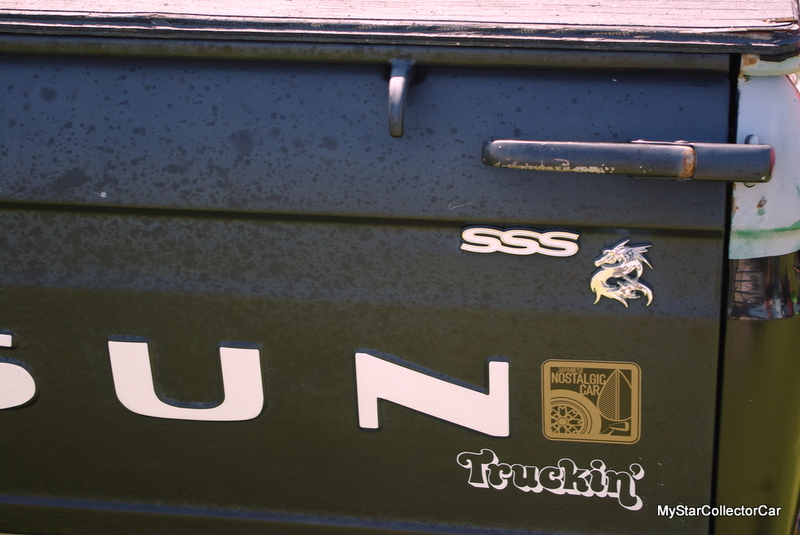 He dropped the stance of his truck at the front but the rear is still at stock specs so he said, “the speedo is bang on”. Dave completely rebuilt the front end because it was “scary on the highway” but now it tracks perfectly and it’s “not even bad turning in a parking lot”. 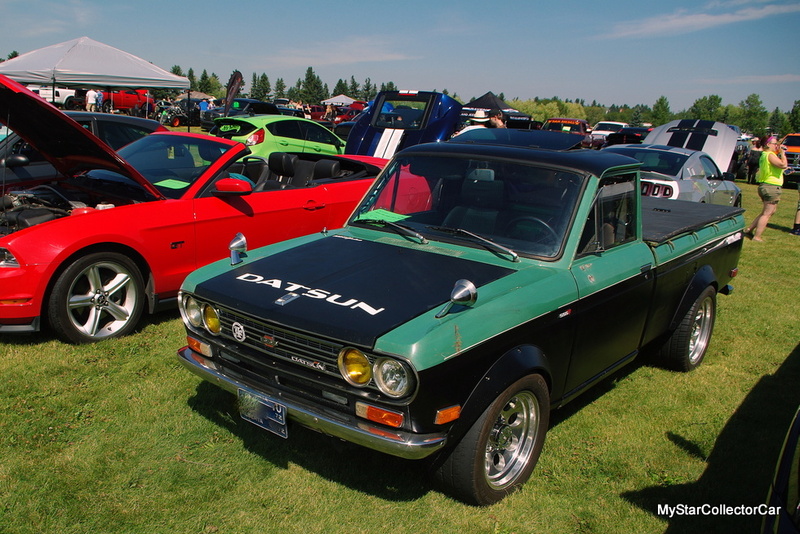 The 510 car version of the Datsun was a formidable track car and Dave’s truck plays in the same league. He said it “really corners and handles well” so he “tends not to look at the speedometer” when he’s on a winding road. 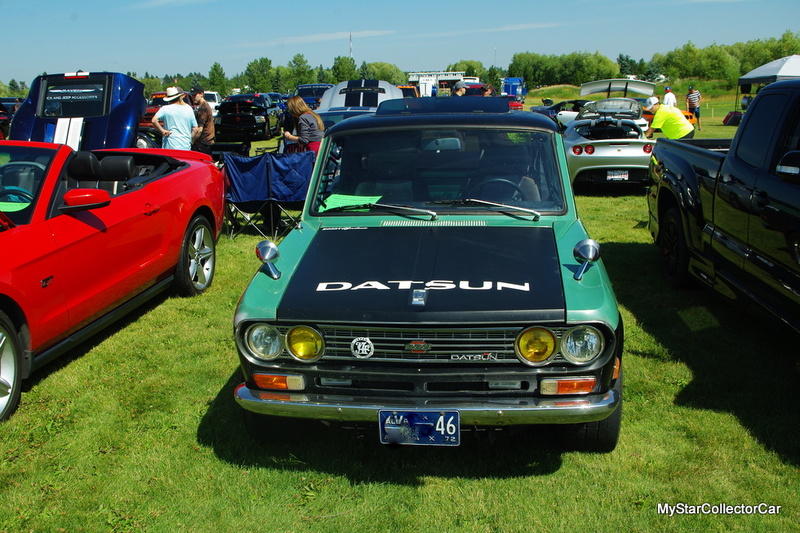 Dave was following a buddy who was putting his car through the paces and his ’72 Datsun “hugged the road like you wouldn’t believe” so Dave had no trouble staying with him. Dave has his mirrors set on the fenders “like they do in Australia” and he likes the setup because “they eliminate blind spots”. He gets about 34 miles per gallon because the “engine doesn’t have to work as hard” and it has “all kinds of power on hills”. He drove it one winter but quit that practice because his truck “was like driving a toboggan—too light, too much power?. These trucks are extremely rare in the 21st century so Dave is often “pulled over for pictures” but he’s patient with his time in the spotlight because he knows how unique his truck is in today’s world. It’s a small price to pay for a period correct tuner truck.